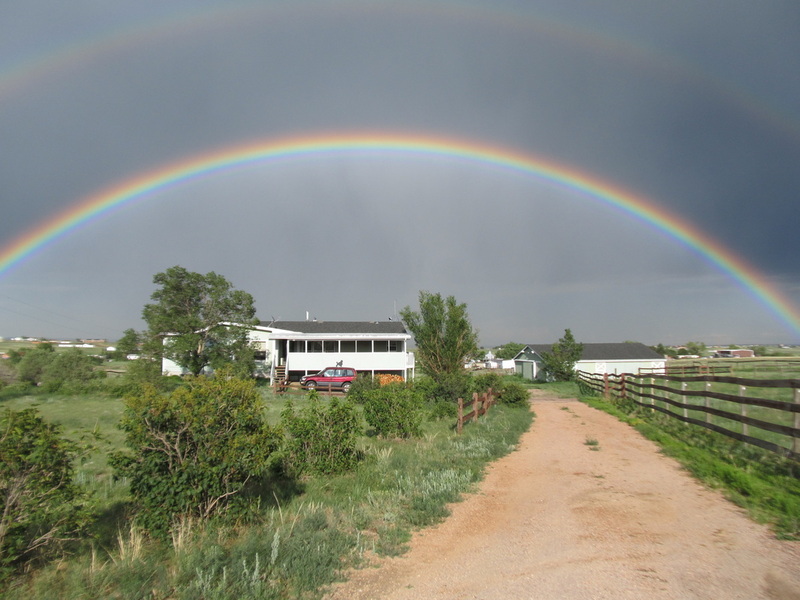 "Where Standard Poodles are Bred for Health, Brains, Beauty and Versatility"
Our home in Falcon. Double Rainbow as well. My name is Angela Morgan. I live in Falcon, CO with my wonderful husband Brad Morgan, and our son Daniel. 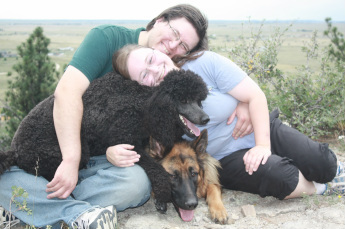 My poodles are my beloved family members; I do not have a kennel and my dogs live in my home with me. I am a dog breeder. I breed quality dogs. I raise quality puppies. I like it. I’m very proud of it. 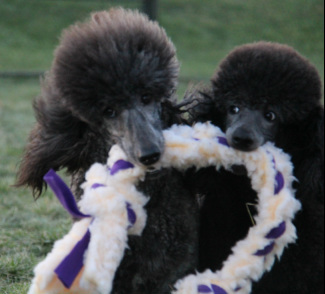 My poodles are my life but not my Livelihood. 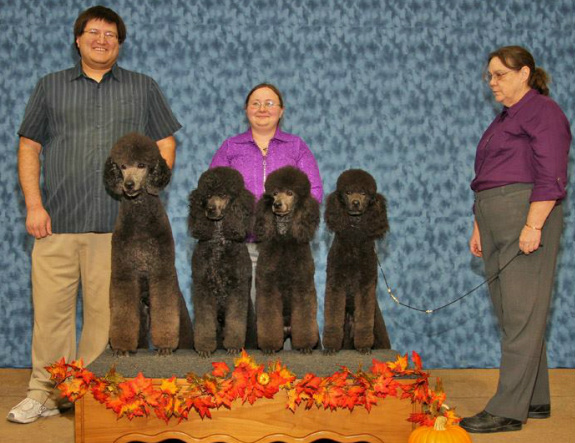 I have been raising Standard Poodles since 2008. I occasionally have a litter of beautiful puppies. They are home raised, right from birth. They are raised underfoot, handled multiple times a day, given lots of attention. These puppies are from genetically tested parents, with Champion Titles/bloodlines and/or performance titles, and bred for their health, temperament, Intelligence, and beauty. My dogs are not specialists, we breed for structurally and mentally sound versatile dogs, because of this my line does tend to produce puppies with good prospects as service dogs and therapy dogs. Puppies are occasionally available, only to approved homes. We reserve the right to refuse to sell a puppy to any home that we don't feel is the best fit for our puppy. WindSwept Standard poodles make excellent family pets and companions. My focus is on temperament, trainability, and health. I do believe that structure and ability go together you must have sound structure to last in any performance venue. My dogs have done or do Conformation, Agility, Hunting training, Herding, Obedience, Rally, Scent work, Lure Coursing, Weight Pull and Pet Therapy. We have also produced several dogs in training and working as service dogs. We are hoping to try Dock Diving, and Barn Hunt in the future. 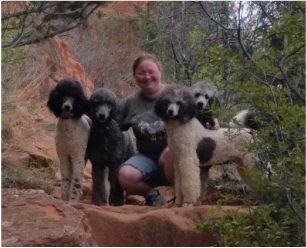 I have worked as a veterinary assistant, worked in a doggy daycare and boarding facility and as professional dog trainer, I worked as a professional dog groomer for around 14 years and received my NDGA Master Groomer Certification in 2008. ​I am currently a stay at home mom to our wonderful son. All pups are AKC registered, sometimes also UKC, vet checked, dewclaws removed, and up-to-date on shots. We do leave natural tails on most of our litters. 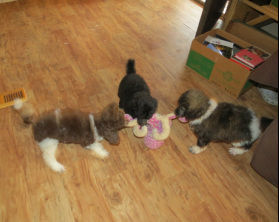 Puppies started having their faces, feet, and tails clipped at four weeks and then once a week until they go home. They also get bathed and blown dry starting at 4 weeks until they go home. They will have been in a car, on a grooming table, been outside weather permitting and gone for short walks. They will be exposed to kids, cats, and other dogs. They will also have had some exposure to our chickens, goats, and horse. We will start crate training and house breaking. We handle our puppies from the moment they are born, I am in the whelping box with the mothers, they need any help I am right there and I am there for support. We try to provide a safe and yet stimulating environment for our puppies to grow up in. The puppies are born in a whelping box in our master bath. Poodles are probably the one of the most under rated breeds there are. 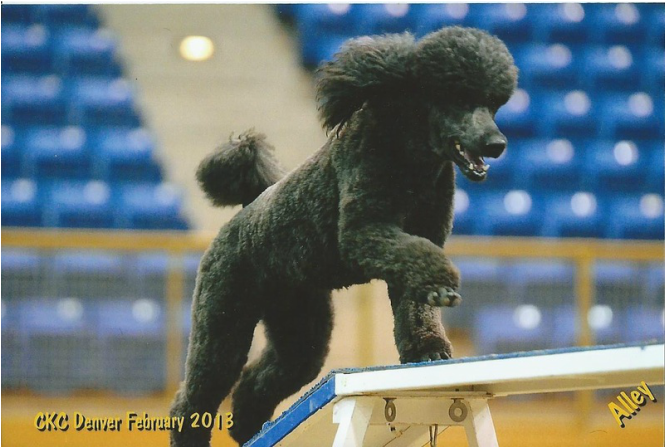 People think poodles are Foo-Foo or Sissy just based on the show dogs they have seen on TV or what they have leaned from others. A poodle doesn't have to be groomed In a show cut. 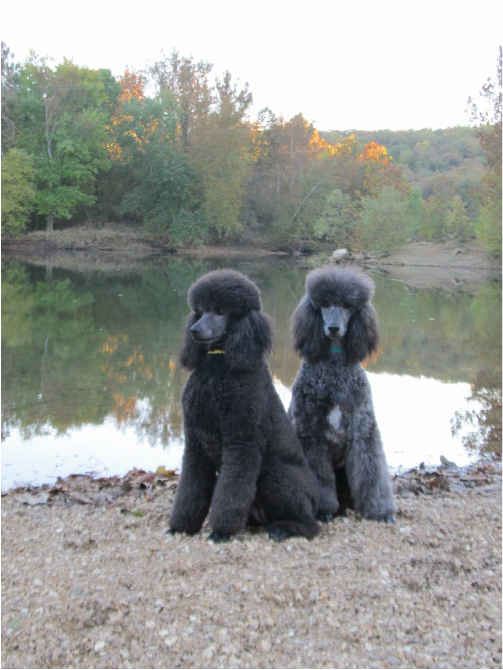 Poodles can be groomed in just about any cut imaginable; trust me I’m a groomer. The most popular is the puppy cut. They have shaved face and feet, one length all over on the body, a pom on the tail, and a topknot. And if you don’t groom your poodles they look like doodle dogs. Most intelligent charts, including the AKC, I believe, recognize the Poodle as the second most intelligent breed, only behind the Border Collie. Poodles do shed but more like humans then most other breeds of dogs. They are as close to hypo-allergenic as any dog can be, as no dog is truly hypoallergenic, unless you buy a stuffed animal. They are generally very hearty dogs. They will run a marathon, swim in an ocean, or just be happy to hang out and watch a football game with you. 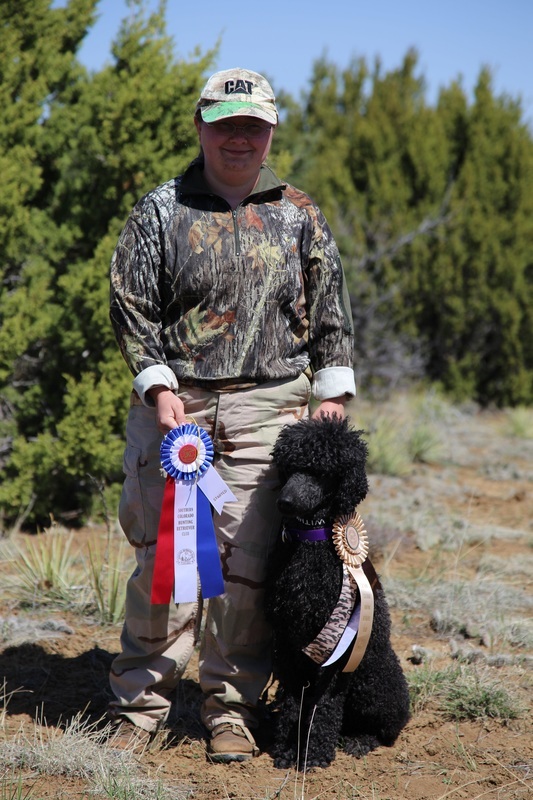 Standard Poodles are a product of their environment, and will quickly take on the disposition of your family, as long as they are bred for temperament. A Poodle truly believes it is a "person" and they expect to be treated as one. Each one is a character and for that reason they make wonderful companions. 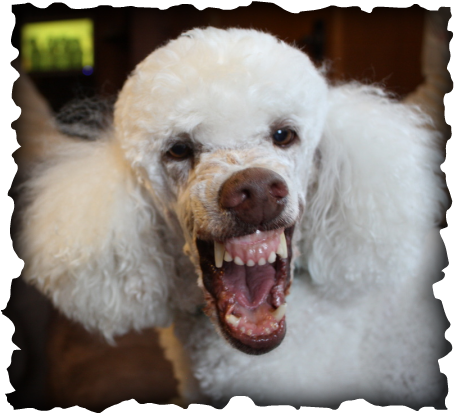 Poodles are meant to be Family pets not outside dogs or yard dogs. to the WindSwept family will be expanding along with Daniel we are expecting baby Morgan August 2019. I will NOT stud my males out for that. Please do not ask! NO EXCEPTIONS! And no, offering more money will not help you. 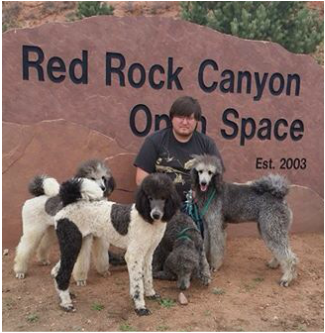 You are welcome to Inquire about my males for poodle puppies. 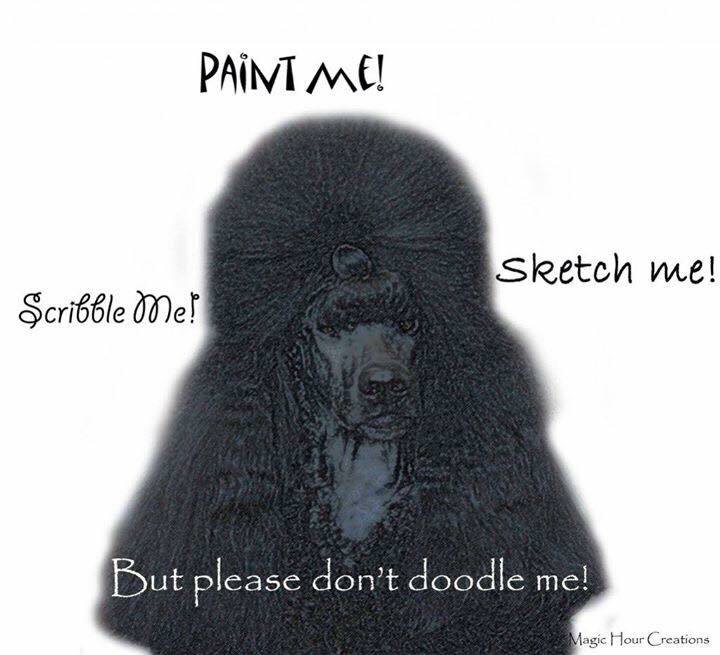 WHY DOODLE WHEN YOU CAN POODLE? 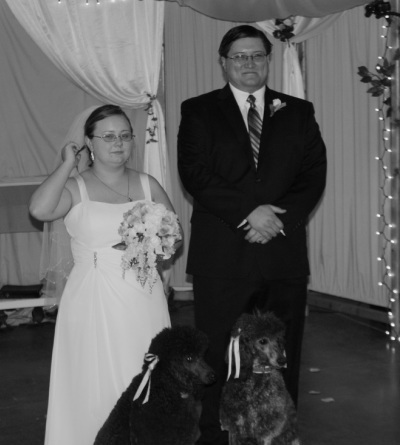 Brad and Me at our wedding reception with Alley our Flower Girl and Dizzy our Ring Bearer. 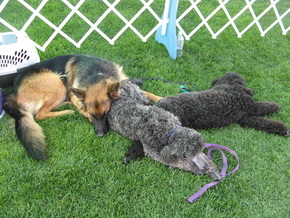 Tired Puppies at an AKC Rally trial.